I'm very young in heart, mind, and energy. I love being spontaneous, yet I am extremely well educated and hard working. I care about my body inside and out; I'm feminine yet athletic and exercise is a must to clear my mind. I come up with my best ideas and solutions while running. Dinner at some quiet unpopular restaurant, just taking time to talk and get to know each other. Jed75 is a Female dating in Pennsylvania, United States. 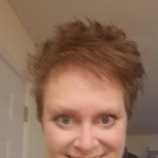 Check the description of this 44 years old profile, she is White/Caucasian and Christian maybe this matches your profile description and you can both start dating in Ireland for free. The stars says she is a Aries maybe you should check your horoscope and match up your star sign.